This unit is actually very great. It makes very smooth and tasty coffee. I like to use it everyday and I very much enjoy using it. Its easy to use and quick. The little espresso containers come with a free luxury-style box and I like to show it to our guests and let them choose the flavor they want. 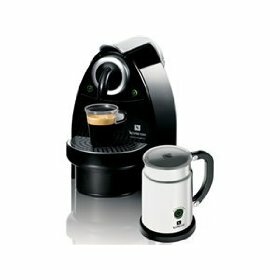 At first, I was against buying espresso machine but my wife really wanted one, and she did a lot of research to find the best value for the money and the one that has the best reviews online. I am really happy that this is the one we bought. The only complaint I have is that it is pretty expensive if you account for the refills price, and that the milk does not get sufficiently hot in the frother. This unit really goes well with my various coffee dosette. Join in and write your own page! It's easy to do. How? Simply click here to return to Nespresso.